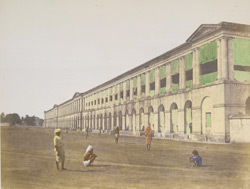 A hand-coloured print of barracks at Hooghly, from the Fiebig Collection: Views of Calcutta and Surrounding Districts, taken by Frederick Fiebig in 1851. Hooghly or Hugli, a town upstream from Calcutta, was founded by the Portuguese in 1537, on the decay of the royal port of Satagaon. The Mughal Emperor Shahjahan (r.1628-58) sacked the town in 1633 with great loss to the Portuguese. By 1651 the East India Company set up a factory here. However, Calcutta, 25 miles away, was considered a superior position on the river and in 1690 Job Charnock succeeded in securing a site there for the subsequent English Factory. The barracks in Hooghly acted as additional defences to Bengal supplementing those at Fort William, Calcutta and at Barrackpore.